The Story of Rehkemper and Son, Inc. The Rehkempers’ company was initially founded as a construction business in St Rose, Illinois in 1869. A physical reminder of the family’s past hangs on the wall of their office: a bill from 1907 drawn up by current owner Jerome Rehkemper’s (89) grandfather. The invoice is for the labor cost of a local two-story building the company built, which is still in use today. The bill total? $56.98. “Of course, when you’re getting paid  cents an hour, you know, it’s different,” says Mike Rehkemper (59), Jerome’s son and co-owner of the company. Clearly, Rehkemper and Son has a long and rich history. What has contributed to the company’s longevity, and how have they remained competitive through all of the twists and turns of the industry? The answer is likely twofold. First, instead of using their storied history as a reason to keep their business model static, they have instead remained one of the most innovative companies in their market, often drawing on their history to anticipate or equip themselves for new opportunities. Second, their beginnings as a construction company have informed their approach as a component manufacturer (CM). They have been able to improve their business model and products by tapping into their knowledge of building construction and design as a whole. And that’s the way his company did go, though in a manner very foreign to today’s methods. At the time, few were building with trusses, so the idea required that he do some convincing of both his family and his customers. Eventually, however, Jerome prevailed. “Sometimes you have to convince the crowd that you’re doing the right thing,” Jerome says. For a while, Jerome, his three brothers, and his father made trusses by hand themselves, “without the aid of any engineering or anything,” he says. “We made trusses with plywood gussets and glue and a trillion staples,” he says. These first truss buildings were built in an environment without building codes and without inspections. Jerome and his family continued to make and sell his handmade plywood gusset trusses in the St. Rose area until 1975, when, Jerome says, “we bought a saw and a press,” which transitioned them into becoming a CM by modern standards. However, Mike points out his father “spent 27 years as a field carpenter before starting the truss business.” This experience served Jerome well, giving him a perspective that would help him anticipate the needs of the marketplace and find ways to reduce jobsite labor. In the early 1980s, the Rehkempers’ business began to slow, so Jerome and Mike strove for growth by entering into new markets and adopting innovative ways to add value for their customers. First, they expanded their focus from solely residential construction to commercial and multi-family. This included constructing a number of large apartment buildings for which the Rehkempers built wall panels. Jerome says, “At that time we didn’t have the technology that we have today in order to lay out and prepare to cut and assemble the wall panel,” so, he says, “all the wall plates were laid out by hand and copied from one building to another.” Jerome explains that “by today’s standards that was primitive, but at that time it was the state of the art.” In addition to the wall panels, the Rehkempers also began offering floor trusses at this time. Jerome’s experience working in the field aided him in his endeavors to innovate and allowed him to offer products that others couldn’t. “I could hand-frame a hip roof out in the field. I could do all the cutting and everything myself. I took that knowledge into the truss plant and we were the first truss plant in the area to furnish a hip set,” he says. Another innovation that the Rehkempers embraced in the early 1980s was the Parallam® beam, which no one had ever seen before in their market. These, too, required the Rehkempers to do a bit of convincing, though perhaps of a more enjoyable kind. To demonstrate the strength of the beams, the Rehkempers would bring them to local events and shows, where they would drive trucks over them. “They had to see it to believe it,” Mike says. The Rehkempers’ business grew in the late 1990s and early 2000s, and, like many CMs at the time, they entered into a period of unprecedented growth that allowed them to add additional plants to their operation. In 1998, they finished building a nearly 100,000 square foot plant next to their existing one in St. Rose. They also added two manufacturing locations in central Illinois and one in Indiana. As for so many, this prosperity quickly evaporated over the course of 2007 and 2008 during the recession. Within that time, Mike says, “We were down 66%.” Builders and lumberyards that the Rehkempers had worked with went out of business, which meant that in certain instances, the Rehkempers “got stuck with not getting paid” for completed work, Mike says. In addition, they closed their smaller operations in central Illinois and Indiana. “One of the biggest achievements of our lives has been to survive that,” says Mike. When so many other CMs were closing, how did the Rehkempers manage to push through? Not willing to remain static, the Rehkempers adjusted their business model, pursuing markets they had not pursued in the past and embracing methods for which they saw opportunity. First, they focused on serving the commercial markets where construction activity remained. Mike says that they pursued large commercial apartment and assisted living center projects. In addition, they pursued working with smaller, specialty builders who worked on larger houses and less on tract homes with the larger builders. “We concentrated on the big houses because they were the only people that had money,” Jerome says. In addition, says Mike, the Rehkempers “went more to a big package approach rather than just doing the trusses.” The Rehkempers also began designing the “beams and floor trusses,” Mike says. “We’d engineer the whole thing.” This approach worked well. Thus, the Rehkempers’ knowledge of and experience with whole house construction yet again contributed to their staying power and success, even through the most difficult business climate they experienced. 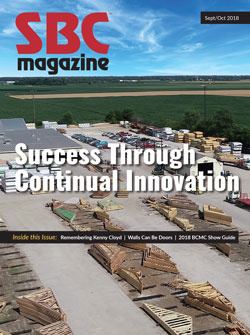 Their whole systems approach helped them decrease jobsite labor time and gave them a competitive advantage in the marketplace, allowing them to not only survive the recession, but to expand their business again shortly thereafter. When the economy gradually started to regain steam in 2010 and 2011, the Rehkempers were in a position to return to buying mode, and added a plant in Springfield, Missouri. The Rehkempers now have over 200 employees working at two locations, as well as a fleet of their own trucks and trailers. They continue their pursuit of innovative products and methods that will help give them an advantage, and are seeking to bring more and more of the building and design process under their roof. The Rehkempers have started an engineering company and are seeking to become the engineer of record for the apartment jobs they work on. This just makes sense for the Rehkempers because, when it comes to engineering and building design, “We do a lot of it anyway,” says Mike. “All we have to do is add the concrete and we do the entire building already,” he adds. In taking on the entirety of the design, Mike hopes to mitigate the potential for conflict and confusion that exists within today’s complex process of communication and requests for information among various players on a project. In terms of engineering specifically, the Rehkempers believe they are in a better position to work with wood than many engineers are today, whose schooling focuses primarily on concrete and steel, keeping them from taking full advantage of the creative potential in wood design that modern methods and technologies make possible. To diversify their services and product offerings, the Rehkempers also work with steel and heavy timber construction methods. However, one of the main areas of focus for the Rehkempers in terms of future growth is their goal to add more value to their current products by increasing the amount of prefabrication they can offer, decreasing the need for jobsite labor. “I’m not a big fan of modular,” Mike says. Instead, he envisions enhancing his current products with other products or features that add value for his customers, possibly including elements added by other trades. The Rehkempers’ approach can serve as a model for other CMs, specifically their willingness to try new things and seek greater involvement in the entire construction process. While not every CM may have the level of whole systems experience that the Rehkempers do, SBCA exists, in part, as a means for CMs to form relationships with those experienced in areas where they are not. Looking to companies like Rehkemper and Son with a long and rich history and learning from them can help ensure the continued success of the industry as a whole. About the author: Kevin Kutschenreuter digs into the building code to help component manufacturers gain greater market acceptance of their innovative products. In addition to running his successful CM business, Jerome Rehkemper has remained active in other organizations and within his community throughout his storied life. Jerome was instrumental in helping to get St. Rose, Illinois designated as a town, and was in charge of St. Rose’s 100th anniversary celebration in 1968. 2018 marks St. Rose’s 150th anniversary, and Jerome will yet again be involved in the festivities. In addition, Jerome actively participated in his local Lions organization and is a 50-year member. He has been named a Melvin Jones Fellow of the Lions. He also served as a vice president with the National Home Builders Association. Editor's Message: It Could Be the ‘Biggest Show on Earth’! CM Perspective: There’s Always Something to Learn from Your Peers!